England's "pathetic" batting collapse in Brisbane has "gifted" the first Ashes Test to Australia, according to former opener Geoffrey Boycott. The tourists lost six wickets for nine runs in 10 overs as they crumbled from 82-2 to 136 all out on day two. "It's very sad to see them almost give away the Test match like this," Boycott said, as Australia closed with a lead of 224 runs. "England are not going to get out of jail here." England's reply to Australia's 295 all out appeared to be going well when they reached 82-2, before Kevin Pietersen (18) clipped Ryan Harris to mid-wicket, signalling the beginning of England's spectacular collapse. Michael Carberry, playing in his first Ashes Test, batted well to reach 40 before being worked over by Mitchell Johnson (4-61), edging to slip. Ian Bell and Matt Prior then fell to consecutive Nathan Lyon deliveries. "It's been decent bowling by Australia but the batting has been pathetic," Boycott, who scored 8,114 runs in 108 Tests for England, told BBC Test Match Special. "They've played some poor shots. The problem is we've seen it all before. "England have an 82-page booklet on what to eat but one guy comes in and bowls at 90mph and they can't handle it. "Australia were always going to come at England like a bull from a gate and that is exactly what happened. If Australia can keep this up, we could be in for a magnificent series." "Australia should now set England 450 to win and get stuck into them in the afternoon session on the third day while they are still shaken up." England's fallibility against pace bowling was evident once again, with both Johnson and Ryan Harris (3-28) bowling faster than their England counterparts. And Michael Vaughan, who captained England to Ashes success in 2005, is worried at the flaws exposed by the Australian bowling attack. "I can never remember such a brutal, nasty day," added Vaughan. "It was 90mph all the way from Johnson and Harris. It was unrelenting. "I feel sorry for the England tail - they know for the next four matches that they will be bombarded with short stuff, with men all around the bat. "When the pitch has zip in it - like at Old Trafford last summer and Perth in the last Ashes series - England show they have got issues. A bit of pace and bounce and they look like being blown away." 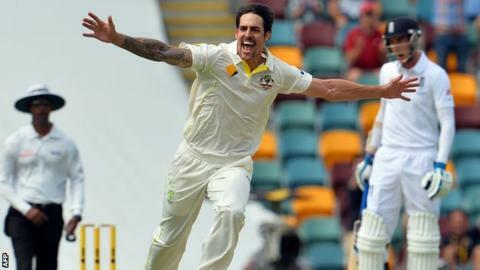 With a commanding lead, and 10 wickets intact, Australia have three days to try to force victory in the series opener. Australia wicketkeeper Brad Haddin top-scored with 94 in the hosts' first innings and said: "The Gabba's one of those grounds where things can happen quite quickly, especially with the extra bounce. "We've got a long way to go in this match and have to turn up tomorrow. It's up to us to make sure we're on." England's only solace is the memory of their last trip to Brisbane in 2010, when Alastair Cook made an unbeaten 235 and Jonathan Trott 135 not out as the tourists recovered from a first-innings deficit of 221 to post 517-1 declared in their second innings. "We know there are still three days to go, so we're not totally out of it," said Carberry. 'We'll come out tomorrow hot. "I think the batsmen obviously feel a little down about the session but the feeling in the dressing room is still pretty positive."